This plush oversized chair and ottoman will be a nice addition to your living room, adding high quality comfort that will truly last. A deep, wide seat ensures you'll stay cozy, with two throw pillows for added comfort. Clean lines and slightly flared arms make this casual contemporary sofa a great choice for any home. The addition of the large rectangular ottoman offers a comfortable spot to rest your feet. The 0977 Casual Contemporary Chair and a Half with Rectangular Ottoman by McCreary Modern at AHFA in the area. Product availability may vary. Contact us for the most current availability on this product. 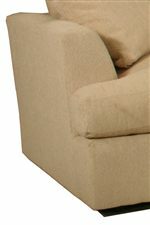 0977-C2B Chair and a Half 1 53" 43" 36"
0977-O2B Large Ottoman 1 26" 45" 17"
Seat Back Plush Back Cushion. Back Height is 26".